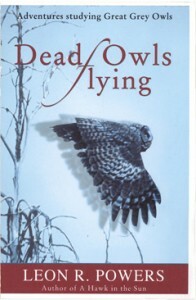 Dead Owls Flying is part memoir, part wildlife adventure and part expose’ of a dark secret. At the heart of this story is Powers’ two-decade study of North America’s largest and possibly rarest owl, the great gray. A celebrity recluse, this huge bird long ago earned such monikers as Gray Ghost of the Woods, and Phantom of the Northern Forests. The embodiment of elusiveness, its rarity only adds to this owl’s mystique – prompting its lofty status among bird watchers and wildlife enthusiasts as one of the most sought after birds in North America. Beginning in 1986 Powers and two of his students began sleuthing out the presence of this rare owl in Long Valley, near Donnelly-McCall, Idaho. Although tracking this owl is a lot like chasing ghosts, the researchers located at least 30 great grays in parts of Long valley. But the passing of time beget troubling signs of habitat degradation. To investigate these ominous trends, Powers conducted a follow-up study between 1997 and 1999. By sheer coincidence, this low profile study propitiously coincided with and benchmarked the ongoing toll of the valley’s extreme make over – measuring the collateral damage to both valley habitat and its celebrity owls. One of the few biologists to study this rare owl, Leon Powers spirits the reader in to the pungent loom of the owl’s forest home and into the intimate center of its reclusive life. Like all of Powers’ writing, Dead Owls Flying is written to inform, entertain and inspire. “What a fun read Dead Owls Flying was! I oved the way you wove in the insane development of Long Valley with the demise of the owls – all to true. “I read Dead Owls Flying today…just as I did A Hawk in the Sun , I was compelled to read the entire book without slumber. The cover design and photos, both front and back and the color scheme is absolutely beautiful. Really as nice of a book cover as I have ever seen…one of my favorite covers and I am an avid collector of paperback and have several thousand in my passion (but only a few are authographed and even fewer inscribed to me)…truly an exquisite cover.